If you want to work for yourself, a big part of your work will be getting up in front of people and speaking. As you might have heard before, most of us fear public speaking more than death! 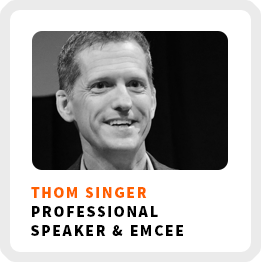 Thom Singer shares how to be a great speaker by telling a great story. And he says if you identify as an introvert it doesn’t mean you don’t have what it takes to become a great speaker! Thom is a professional speaker and emcee. He also hosts his own podcast, Cool Things Entrepreneurs Do. I was recently on his show and we had a great conversation about how work is changing. He has delivered 800+ speeches, so this guy knows what he talking about when it comes to delivering a memorable presentation. The difference between being a speaker and a professional emcee. Why introverts can be great storytellers, too. Treat speaking like any other skill and practice it to get better. The groundwork he laid to not start his business from zero when he was laid off. Core work activities + habits: 1) Do great work on stage. 2) Market himself. 3) Be a nice person. Ideal work environment: When he can be the opening keynote speaker and then be the master of ceremonies for a 2-3 day event. 90-day goal: Get his sales back up to his original goal. 1) Google successful entrepreneurs who started after 60, like Colonel Sanders. 2) Commit to making your later life better and use that as a base for decision making. 3) Adjust your mindset to think it’s never too late.